It's now about 3 AM now and my body thinks it's daytime despite the darkness outside because it's on a different time zone. I think it's time to give my finger and toe nails a complete overhaul in preparation for flip flops and sandals season since I can't sleep. I don't know about you but I do judge if a guy or gal does not have nice looking nails. Somehow having yucky nails really take away from style brownie point. I have a huge aversion for others touching my hands and feet so I usually do my own nails. I am so ticklish, I will laugh helplessly on the floor if anyone gets within an inch of my feet. I usually don't buy the expensive products for my nails, instead all the nail care products I buy are readily available for purchase at most drug and convenience stores. Anyhoo, I usually start my own mani and pedi by removing excess cuticle with cuticle removal cream(1). I avoid having my cuticle cut due to a bad experience from years ago. Is it just me or seeing people wearing flip flops and sandals with hard callus feet are just very unattractive? 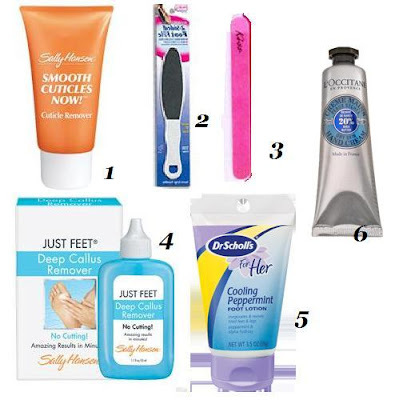 To start the process, I like Sally Hansen Deep Callus Removers (4). Hard callus does not disappear as the product claims but this procedure makes buffing with a pumice stone/ or pedi stick (2) so much easier. Also in order to have healthy glossy nails, I will buff both finger and toe nails with Kiss buffer (3) first with the black side to smooth out uneven nail surface and then using the pink side to buff nail surface to high gloss. After all the prep work, I will massage my feet with Dr. Scholl's Cooling Peppermint Foot Lotion (5) to relax my poor feet and to exfoliate dead skin from the knee down. It's wonderful on the hard skin around the knee area. Finally, to finish my treatment, I will apply L'Occitane Shea Butter Hand Lotion on my hands and feet to leave both hydrated and soft. If I have time, I will actually wrap clear plastic wrap on my feet to ensure full hydration. This additional procedure really leaves my feet extra soft. The entire process takes about 60 minutes without applying nail polish but beautifully manicured hands and feet are priceless. So how do you care for your hands and feet in preparation for summer? What a great post!! I am def. going to pick up some of the cooling peppermint lotion!! I never do pedi's myself - but I may need to start!! Love these tools, especially #2 - essential for me in prepping my tooties for spring! i love L'Occitane Shea Butter products. and i need to get my hands and feet taken care of soon, as it is time for SANDALS!!!! I need a pedicure like you wouldn't believe! I will try to maintainly weekly but a complete treatment once a month. I can't work on my own nails too. I leave my nail to the professional too! Taking care of your feet is definitely more important now that spring is here!